Die With Me by Elena Forbes, a Mysterious Review. Review: There's a serial-killer pattern to the three female teenaged murders staged as suicides in London's affluent Ealing district. But are other murders linked as well? DI Mark Tartaglia and his female sidekick, DS Sam Donovan, of Elena Forbes' riveting debut novel, Die With Me, think so. But now they've got to prove the connections despite a scarcity of clues and witnesses, obstruction from their superior officers, untimely leaks to the press and deliberate interference from a Behavioural Investigative Analyst with behavioural quirks of his own. 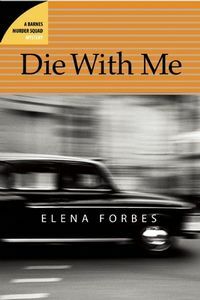 A riveting British police procedural that reads like a blend of the best of America's Law and Order (any series you want), Criminal Minds and CSI (again, any version), Forbes' Die With Me is an explosive start for the Mark Tartaglia series. Forbes' novel is an intricate mesh of plots and sub-plots and of modern and traditional investigative techniques. There is the main storyline, of course, that involves the serial killer murders of the three young girls, all found as apparent suicides in a "Die with me" pact in churches, all posed as brides, all drugged, and all with missing locks of hair. Then there are the "alike but different" murders of some other older women that set Tartaglia and Donovan and their team members searching for similarities to the press-dubbed "Bridegroom" murders. In telling the stories, Forbes recounts revealing episodes about the killer, describing the chilling details of his upbringing, the reasons for his psychological aberrations, even, the revenge he has taken on his family members before embarking on his murderous trail. It's an alarming in-depth and realistic look into the crazed mind of a murderer, complete with his hatred for women, his accompanying vile language and hallucinatory visits from his murdered grandparents. More fearful still is his success in luring his vulnerable victims in person, by telephone or by emails even as the reader, anticipating what is to come, wants to shout out to them, "Watch out! He's dangerous. Don't get involved." An episode of a potential victim's escape, tragic assault by others and her re-capture and killing by the murderer is compellingly horrific, and a roller coaster ride of the reader's emotions. Besides the storyline suspense of ultimately finding and capturing the killer before he executes his next victim, there's the tension between characters created when Tartaglia is reassigned to report to a female supervisor with polar opposite views to his about the developing science of Behavioural Investigative Analysis. For him it's pseudo-science but she's in favour, so she hires a consultant with whom she's had an earlier fling and Tartaglia has had a previous run in. Flings are nothing new, though, since Tartaglia has one of his own going with the local forensic pathologist who isn't completely honest with him about another relationship she's having. Then, his newly-appointed boss becomes an email and telephone target of the killer. Or could it be someone else? And to add to the mystery of the events Tartaglia discovers that the BIA consultant needs to come clean about what he's been up to late at night in a neighbourhood backyard. Donovan, too, has secrets about her feelings for her boss, and when she decides to look elsewhere for romance, it's a search she quickly comes to regret. Tartaglia's got regrets as well, with some more serious than others, but with all of them coupled to the surprise ending to the story and opening the door for the next case in Forbes' soon to be released Our Lady of Pain, to be reviewed here in coming weeks. Special thanks to M. Wayne Cunningham (mw_cunningham@telus.net) for contributing his review of Die With Me.